If you’re on the lookout for a dependable cloud-based backup service, then check out our IDrive review to learn everything about this outstanding company. IDrive Backup is a cloud storage, backup, and restore service, oriented towards multi-platforms interlinking and increased data load security. This cloud-based solution is the brainchild of IDrive Inc., a tech company solely specialized in top-notch data backup services like IDriveSync, IDrive EVS, IDrive Lite, IDrive Portable and IDrive Express. IDrive is a cloud storage service capable of backing up files to a local drive, mapped network, or to the cloud. It can restore lost files, migrate critical files and folders to the cloud, and keep track of any changes to the files. You can share your files with your contact or even with people who aren’t using IDrive. Additionally, you can create public links to your files. As an added bonus, you can backup and restore your photos and video on your social media account with the help of IDrive. IDrive Smart Docs – take photos of your favorite docs. Smart Docs will recognize them and will save a copy in the cloud. IDrive has pricing schemes that can accommodate both personal and SME needs. The service offers two basic types of accounts: free and paid. Users subscribing to a free account will receive 5 GB of backup/cloud space for as long as they keep their account active, and an additional 5 GB of sync space. If you want to register for a free account, you won’t be required to submit your credit card number or your CVV code. Furthermore, compared to another cloud-based service like SugarSync or SpiderOak that offer a limited free period, IDrive’s free account offer doesn’t have an expiration date. IDrive has many business plans, to accommodate every client, all at unbeatable prices and storage allotment. You can find more information about these plans on their website. IDrive for business also includes monthly billed accounts, which just goes to show how flexible a cloud storage and backup service can become. After reviewing the IDrive pricing plans, we take a look at the features included in these plans. In our IDrive review, we tried to test out all the basic features we would expect a cloud backup service to have. We wanted to see how these features actually work for customers. After creating your account, and installing the application, the manager will automatically scan your computer for files and folders to back up. In a matter of seconds, you will see a bar showing you the status of your uploading process. There are a couple of ways to back up your files, the most obvious approach being to let the manager doing its job on the first launch. IDrive typically lets users select which files should be committed to the cloud or the local drive, via the “change” button. Alternatively, if you have the bulk of files that need immediate backup, you can select the “view excluded files” list to instruct the manager on what folder or files with path names or with partial should it exclude the next time a backup occurs. Furthermore, to help the user keep track of your uploaded files and folder, IDrive has also included a nifty search bar in the web-based manager. You can schedule backups from the app manager, or manually backup files yourself. During our IDrive review, we’ve discovered that restoring your lost or compromised files is very easy. If you’re using the IDrive desktop manager, all you have to do is to head on over to the “Restore” section and review all your files stored either on the cloud or the local drive. When you select a file, the IDrive manager will automatically display the version of each file. After selecting the files, hit the “Restore Now” button to begin to process. One thing we liked about IDrive is that the restored files are directly downloaded on your local drive, without being archived. Alternatively, you can tell the manager to restore the files to their initial folders, without having to move them manually after the process is completed. Let’s move further in our IDrive review security features. To guarantee that all your data is safe, IDrive employs a 256-bit encryption key, for files which are about to be transferred to the cloud. On top of that, the actual connection is secured used a 128-bit encryption key. Users will also be prompted to create their private encryption key when creating their account. Furthermore, IDrive keeps its own data centers, which are under constant surveillance. In the event that your computer is stolen, you can require a remote wipe via the IDrive customer service. By the default, the syncing function is turned off. You have to manually enable it in your IDrive manager, then create a syncing folder on your desktop. Once you’ve set up syncing, you can just drop files in the syncing folder, and they will automatically update across all devices. This feature is essential when you’re using the IDrive mobile app in conjunction with the desktop app, as keeping large amounts of information up to date across multiple devices can become frustrating otherwise. IDrive also has a file versioning option. You can store up to 30 different versions of the same file. You can set the number of versions you want IDrive to keep from the desktop manager. IDrive also features a file sharing function. You can create links to files, which you can then share through emails. So, let’s wrap up our IDrive Backup review with the pros and cons section. During our IDrive review, the first alternative we thought of was Syncplicity. In our Syncplicity review, we discussed how easy it is to use this cloud backup service. By comparison, IDrive is a bit awkward and cumbersome to use. On the other hand, IDrive has more features and options than Syncplicity. Still, it could have been a bit more user-friendly. As far as download and upload speed is concerned, we noticed in our IDrive review that this cloud backup system tends to be sluggish. We would have preferred it if they gave you the possibility to choose these speeds like the Touro backup system does. If download and upload speed are your concern, Touro is definitely a solid alternative. To conclude our IDrive review, we have to convey a few thoughts on this service. 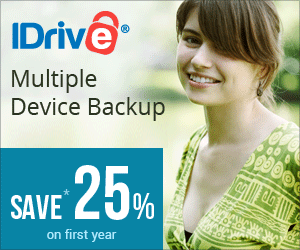 Although it does not offer unlimited storage, IDrive’s plans managed to meet the cloud needs of any customer. If you have a home computer, and need a good and reliable cloud storage and backup service, then IDrive might be your cup of tea. Our recommendation is to start small with a free 5 GB account, and try it out for a couple of months before upgrading your plan. Overall, the service’s performance is satisfactory, managing to maintain that balance between functionality, quality, and price.